Gadija at Kalky\’s. Photo: David Harrison. I cannot lament the demise of the great British fish-and-chip shop. The last chippie I ate at was in Soho, London. Some readers will immediately recognise it. I can only theorise: the fish was caught after it committed suicide; was frozen for a year; defrosted in a microwave on the wrong setting; left out overnight; rolled (with its skin still on) in an industrial instant batter mix; plunged into 80-year-old oil that wasn’t yet hot enough; bagged with half-cooked chips; saturated with the worst spirit vinegar; sat on by the owner, and then served to me. For extra measure, the fillet contained several mischievous bones. Britain’s national street food, fish ‘n’ chips, kept millions alive with cheap hot meals through two world wars. At one stage, there was a fish-and-chip shop for every 2000 people in the country. Although considered traditional, the chipper emerged quite late, after 1860, only slightly predating the burger in the USA. The idea was pinched from the Jews of England who habitually fried fish. Initially, they were rather disgusting places in the back alleys from the stink of the cottonseed oil used for frying and the stench of fish guts. Over time, the industry cleaned up with improved oils. The customary newspaper wrapping was replaced with the ineffective brown bag, oozing grease, turning chips and batter soggy, ruining couches and car seats everywhere. Good shops used fresh fish, usually cod and skate in London, and in Lancashire, the other capital of the fish-and-chip shop, hake. The batter was made with beer, and the chips crisped in lard, and doused with malt vinegar only. Initially fish-and-chip shops in South Africa were the province of industrious Portuguese immigrants. These independents are now mostly replaced by chains, such as Snoekies, originally established in Hout Bay in 1951, and now with about 20 branches in the Western Cape; Texies, which has been going since 1972 and has eight outlets in Cape Town; the Old Fashioned Fish and Chip Takeway with 345 stores nationwide; the Fish and Chip Company – they of the Zuma advert – with 300 stores and the slogan “traditional English style food” and a Union Jack in its logo. 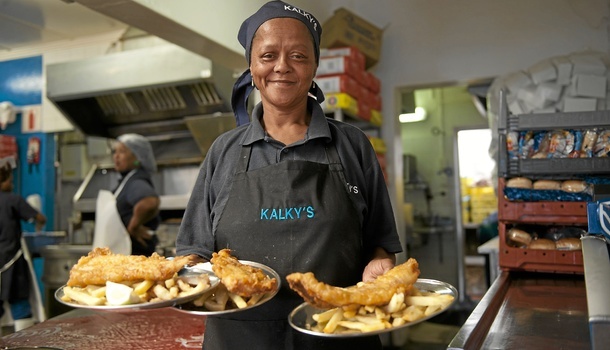 Possibly the oldest surviving independent is Kalky’s, owned by Elisabeth Rosslind for the past 15 years, although the place dates back to the 50s. The best way to visit from Cape Town is by train, a comfortable ride less than an hour. A return ticket is at the unbeatable price of R22. If you’re over 60 you can travel free on Tuesdays. Sit on the left side; the strip from Muizenberg to Kalk Bay right on the edge of the ocean must be one of the most spectacular train rides in the world. Located inside the picturesque fishing harbour, Kalky’s is a short walk from the station across the railway line and past the little chapel where the fishermen pray before going out to sea. Essentially an expanded wooden shack, you are greeted with a banner “Love Milk, Love Fruit, Love Chocolate, Love Kalky’s”, and signs “no loitering” and “ATM inside”. The ceiling is dressed overall with lines of pendant flags of the world. The woodwork is colourful, reminding one of the local fishing boats’ colours, and the tables covered in red PVC cloths branded by Coca Cola. You order and pay at the counter, where you will most likely encounter Allison, Rosslind’s daughter, and the genial manager George Mandalios, who also runs traditional hand-line fishing trips. Kalky’s is almost always bustling and at peak times on peak days the queues stretch. Knives and forks are plastic, but you eat off sensible Continental china plates. In a wooden box on the table are condiments – tomato sauce, vinegar, iodised salt, and tomato chili – in large, oily anonymous bottles. The inimitable Gadija shouts out the receipt slip numbers, “247 going to heaven …” She also has playful outbursts, such as repeating “Eet en uit!” (eat up and get out), to which a customer chirps, “Dis ’n lelikke gasvrou daai!” (that’s an obnoxious hostess). The menu includes Harders and chips for R22, fishcakes and a roll for R16, or snoek heads. But you could also splash out on a Kalky’s platter with eight prawns, hake, calamari , rice and chips for R180. Most people go for the deep fried hake with chips (R46). Deep-frying may be calorific but many claim that the fish itself is better served as it is steamed inside its sealed envelope preserving the amino acids and B vitamins. The fish comes with onions and a blob of butter, small lemon wedges (if you want extra its 50 cents each) and tartare sauce is R4.50. Kingklip and chips is fairly steep at R105, and I found it indistinguishable from the hake; we’re still debating which was which. It would be a wonderful story if I could report that this humble little survivor serves arguably the best fish and chips in the Cape, but alas, it is not the case. By the standards of fish-and-chip shops in general it’s on a par, but by most restaurant standards it is not good value. The Ocean Basket chain does a better hake and chips for R38.50 and their kingklip is R89.50 with no extra R5 charge for grilling. One goes to Kalky’s instead for the vibe, more for the banter than the batter. Overseas tourists sit sipping wine among halal locals and fisher folk, and there is plenty to overhear. After lunch take a stroll around the fish market and out along the harbour pier; then grab a coffee at one of the many cafés along Kalk Bay Main Road, browse the galleries and bric-a-brac shops en route to the station, before catching the train back to the city. Remember to sit on the right side now. Kalky’s, Kalk Bay Harbour. Tel: 021 788 1726. Open 10am to 8pm 7 days a week. This article first apeared in the Mail & Guardian, 5 April 2013.